Pope Francis addresses a joint meeting of Congress at the U.S. Capitol in Washington Sept. 24. In the first such speech by a pope, he called on Congress to stop bickering as the world needs help. (CNS photo/Paul Haring) See POPE-CONGRESS Sept. 24, 2015. WASHINGTON (CNS) — As Pope Francis spoke to a joint meeting of Congress Sept. 24, the members of the House and Senate vacillated between their usual response to similar addresses and intensely focusing on the pontiff’s heavily accented, carefully pronounced delivery of a text in English. 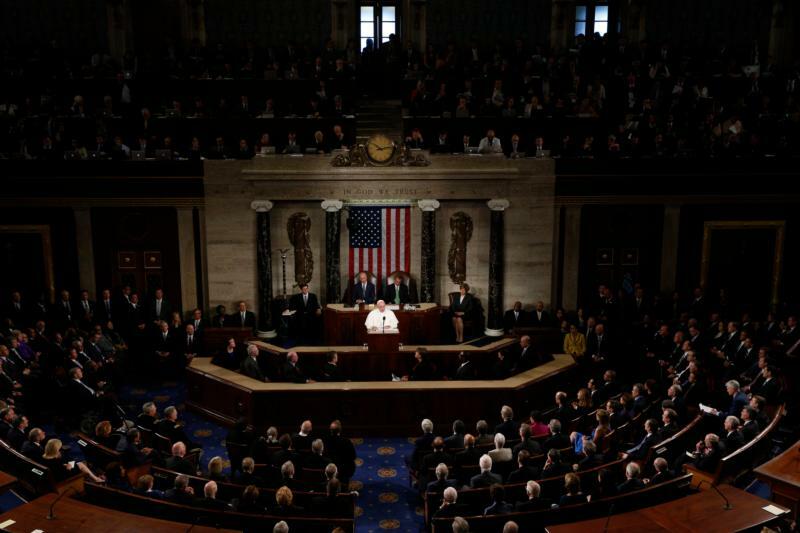 Every seat in the chamber and the galleries above was occupied for the much-anticipated first speech by a pope to the combined members of Congress, the Cabinet, four members of the Supreme Court and representatives of the diplomatic corps and many guests. House Speaker John Boehner, a Catholic Republican from Ohio, and House Minority Leader Nancy Pelosi, a Catholic Democrat from California, invited the pontiff. Previously, Boehner had unsuccessfully invited Pope Francis’ two predecessors to address a joint meeting. His counterpart as head of the Senate, Vice President Joe Biden, sat alongside him behind Pope Francis, much as they do during the president’s State of the Union addresses. It was perhaps a measure of the unusual speech that Pope Francis’ arrival in the chamber was announced ceremonially with the awkward-sounding: “the pope of the Holy See.” The pope is the head of the Catholic Church, and the Holy See is generally used as a religious reference. But the Holy See also is recognized as a sovereign state. Boehner, who is known for readily crying, was true to his reputation, appearing to choke up at points during the speech and clearly doing so as he later stood alongside him on the West Terrace of the Capitol when the pope briefly greeted an assembled crowd of tens of thousands of people on the lawn. In very brief remarks from the terrace, translated into English for the public, Pope Francis said he was grateful for all who came to the event, particularly for the children. “God bless them,” he said. At other points in the 45-minute speech, however, the body’s partisan roots seemed to carry the moment. At the pope’s laudatory mention of reopening dialogue between countries that have been at odds, some members of Congress were quick to respond with applause. Others seemed uncertain whether the reference was about Iran, Cuba, Colombia or some other situation with which they might or might not agree. The speech was among the hardest tickets to get during the pope’s three-day visit in Washington. Each member of Congress was allotted one guest ticket. More than a dozen bishops and cardinals were in the room, however. Washington Cardinal Donald W. Wuerl and Cardinal Theodore E. McCarrick, Washington’s retired archbishop, were among them. Nearly all the seating sections in the gallery above the House floor appeared to include at least one priest and/or a bishop. Reporters from around the globe were added into the normal contingent of political writers, crammed into standing-room spots above the speaker’s rostrum, with no view of the podium. Vatican reporters accustomed to parsing the tightly written prose of papal speeches worked alongside Washington-based writers whose usual work involves vote-counting and filtering broad political rhetoric. While the pope was in the Capitol, Boehner met with him and a contingent of Catholic bishops in his office, and took him on a brief tour of Statuary Hall. There, the pope was shown the statue of St. Junipero Serra, canonized by Pope Francis just the day before. Serra, a Spanish Franciscan missionary is one of the two statues placed in the Capitol by the state of California. Each state is allocated two slots. Video shot by the press pool also captured a moment in a hallway, when Pope Francis was shown bowing his head for a blessing. Fellow Jesuit Father Patrick J. Conroy, chaplain of the House of Representatives, placed his hands on either side of the pope’s head for the blessing. Father Conroy told Catholic News Service later that he thought to offer the pope a blessing rather than making a typical comment in the brief time they would have to speak when they met in the hallway off the Capitol’s carriage entrance. “I figured he’d probably be willing to accept that,” he said, particularly in light of Pope Francis’ first remarks to the public after his election in 2013. Speaking from the balcony of the papal apartment in the Vatican, the newly elected pope asked the people to pray for him. Father Conroy said he introduced himself, welcomed him to Washington and speaking as one Jesuit to another, offered the blessing.